This moth emerged from a coast live oak acorn I collected in November and kept in my (heated) house. The moth doesn't look too good here because it was chilled for the photograph ... a little too much, but after a few more photos it flew off. 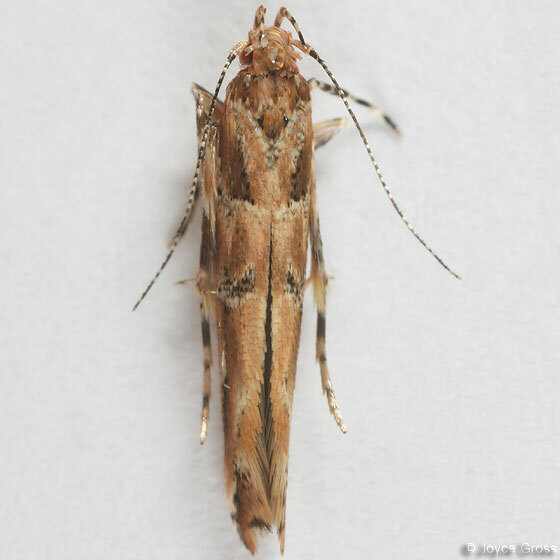 There are three species of this genus in eastern North America. P. badia was also known to Ronald W. Hodges (MONA Fascicle 6.1; 1978) to have a disjunct population in Orange County, California, where it flies from April to December. Thanks Bob!!! I didn't expect a species id on this, so this is great. How do these fragile creatures emerge from an acorn? I'm guessing the larva will bore a large enough hole to exit from before it pupates. The two moths I've gotten out of acorns both emerged from acorns that already had holes in them (that someone else might have made, ie. a weevil). However, I haven't been keeping track of the numbers of holes, so I'm not really sure if the moths came out of pre-existing holes or if they made their own.